5,289 backers pledged $524,170 to help bring this project to life. The new Adventure Edition of the best-selling, multiple-award winning "Fast! Furious! Fun!" Savage Worlds Roleplaying Game! We've taken everything we've learned over the last 15 years...all the feedback you've given us via our forums, social media, store, convention, and personal play...to make it faster, more furious, and more fun! We're especially proud this version combines the tactical nature of the original system with the best elements of narrative play. This is the most beautiful version of the game we've ever done, with full-color interior pages by incredibly talented artists from all over the world. We're also adding a deluxe box of all the Essential accessories players and Game Masters ask for...new Oversize Action Deck, official Savage Worlds Bennies, GM screen, Power & Status Cards, and more! Levels below include all digital Stretch Goals. Physical stretch goals are added to the Savage Worlds Essentials boxed set. The Savage Worlds Adventure Edition is hardcover, 208 full color pages, and in our popular graphic novel format (about 7" by 10.5″). The BEST DEAL is Ultimate: the Essentials Boxed Set, the Core Rules, AND the leatherette Collector's Edition for $200 (a savings of $40)! For the first time EVER...a true Savage Worlds Collector's Edition! It features a black leatherette cover with golden metal grommets, embroidery around the embossed logo, matching corner protectors on each outside edge, three bookmark ribbons, and an interior plate signed by Shane Lacy Hensley AND Clint & Jodi Black! * Update: We're going to print a limited amount of extras for the pledge manager for those who want to order extra copies or are combining shipping for friends. If there are leftovers they will be offered as available on our website or at conventions as circumstances allow. Kickstarter Exclusive Signed Collector's Edition! Eight official translation partners (French, German, Korean, Italian, Polish, Portuguese, Russian, and Spanish). More than a hundred officially licensed companies. Official Pinnacle licensed settings include Flash Gordon™, The Sixth Gun™, Lankhmar, The Goon™, and Palladium's Rifts®! Savage Worlds hasn't changed much since it was first released in 2003, but there have been a few significant changes. We also updated our graphic design, art, and size to match our current graphic novel format and showcase the incredible artists who have come on board since we began. With any new printing we try to make things better, and the Adventure Edition received the same treatment. We've been listening—literally—to tens of thousands of players and Game Masters from all over the world for more than a decade. Shane Hensley, Clint Black, and the rest of the Pinnacle team have gathered and discussed the points they've raised for years and slowly but surely gathered them into this new Adventure Edition...faster, more furious, and more fun...thanks to YOU! For backwards compatibility with previous settings, a simple conversion guide will be made available to download for free to update from Savage Worlds Deluxe to Savage Worlds Adventure Edition. See the FAQ. A beautiful sturdy box with all the accessories you need to run and play Savage Worlds! There's even room to store your core book inside. The Savage Worlds Adventure Edition GM's Screen! Perfect for any genre! All four Mini Settings will be printed and bound with the GM Screen so your group can play immediately! Twenty-five Bennies you can use with any genre! Clear acrylic Blast and Cone Templates with laser etched markings for maximum durability! Note that all previously released settings listed below were written for Savage Worlds Deluxe. Some aspects of those books will need conversion using the free guide we'll post for free sometime after the Kickstarter. We'll add a punch sheet of high-quality, textured cardstock Status Tokens to the Essentials boxed set! These are great for miniatures OR sitting around the table playing "theater of the mind." High quality cardboard Status Tokens for the Essentials boxed set! ($240K) Actual play videos of the new rules in ETU: Undeclared! The SavingThrow crew behind WildCards take you to the sleepy town of Pinebox, TX, in the 1980s for THREE EPISODES, showing off the new Savage Worlds Adventure Edition rules! Start by watching the first episode on YouTube here to see the new rules in action! ​​($260K) Catch Up Stretch Goal! Power & Status cards come to ALL backers in PDF. We'll also add "form fillable" blanks you can use to create your own! A print version will be made available as a separate Add On! Note too that the Savage Worlds Essentials boxed set will be $149.99 at retail, so picking it up during the Kickstarter is a FANTASTIC deal! A bundle of one of our BEST SELLING games ever, Deadlands Noir by John Goff with art by three-time Hugo Award winning Cheyenne Wright! This gritty combination of detective work, pulp action, and horror was our first Kickstarter! Find out all about publishing YOUR Savage Worlds settings, adventures, and more here! ​($310K) Mini-Setting 3: Tesla Rangers! By Pinnacle / Arcane Times / Girl Genius artist and three-time Hugo Award Winning Artist Cheyenne Wright! The acrylic Burst and Cone Templates in the Essentials box are clear so you can see the minis beneath them, but we also have downloadable templates you can print in beautiful fiery orange. We've expanded the core book to 208 pages! By Deadlands Line Editor Matthew Cutter! The War of Independence is won...but the herculean effort to build a more perfect union has only started. This isn’t history—this is Pulp History in the post-Revolutionary Era! Fantasy Grounds users see the FAQ. Relax for a lakeside Spring Break at The Retreat – if you can ignore the scratching at the door and the deadly smiles of the townsfolk! The suspicious death of an old friend drives you to find answers somewhere in the Moonshine Blues of New Orleans, where mobsters and magic mingle! For Deadlands Noir or any horror game! ​($360K) World Builder's Guide Expansion 5: Savage Worlds for All Ages! ​($370K) Savage Worlds Map Pack! BJ Hensley's Lost City of Astla! Shane Hensley talks about maintaining and overseeing various settings for years and even decades, featuring Deadlands and all the other worlds of Pinnacle. ​($400K) Return of...the Adventure Deck! You can’t have an Adventure Edition without an Adventure DECK, can you ? This is the big one...the one you've been asking for! We'll not only finish our update of the Adventure Deck and give it to everyone in PDF (including customizable blanks), we'll also put a PRINT version inside every Savage Worlds Essentials boxed set! Our biggest Kickstarter so far was for the incredible Savage Rifts®. If we beat it, every backer gets a free copy of Ross Watson's adventure, Murderthon! $440K: Deadlands the Weird West Player's Guide & Marshal's Handbook! Our final entry is a collection of smaller articles from the PEG team and our most prolific Game Masters, players, artists, and freelance designers featuring their favorite tips, tricks, and favorite moments from Savage Worlds! Read about customizing Chases, Dramatic Tasks, Mass Battles and more, how Ed Wetterman runs his big Celebrity games at Chupacabracon, Shane's experience as an American running games in foreign countries, photos from some of our friends' epic miniatures and scenery, and anything else we can fit in from our friends all around the world! Photo courtesy of Eric Lamoureux and Just Insert Imagination "Wiseguys," one of the many JumpStarts you get for backing this project at the Digital level or above! Final Stretch Goals...This Time for Sure? Look for more every day of the Kickstarter! JumpStarts will be delivered in the months following this Kickstarter as each partner delivers the document to us. *JumpStart Disclaimer: We have lots of JumpStarts from our various partners heading your way and want to make it clear that each one is the responsibility of their various owners. We’ll distribute the documents in bundles as they’re given to us. Please note Pinnacle cannot guarantee their quality, creation, or delivery. Make your base pledge now and add any extra in the pledge manager, which we plan to send out before the end of the year. That saves confusion here, saves us on fees, and helps give you the best rate on your final shipping costs as well. You can even buddy up with a friend by making one pledge and adding in the extras into your package. Click for an expanded image! Your support helps us print the book and make the extras. This means delivery of the main PDFs about a month after funding and the physical products about 5 months later depending on the printer and shipping. Shortly after all funds are collected (typically 3 weeks after the end of the Kickstarter), we'll begin delivering PDF rewards through DriveThruRPG.com. PDFs will also be available through PEGinc.com. Click here to browse our selection at DriveThruRPG now! Our company is based in the United States. A third party shipping service will pack and fulfill most orders. We have partnered with fulfillment centers in Australia, Canada, France, and the United States. It is our hope that this results in lower customs taxes and shipping costs for many of you. Those living in New Zealand and the European Free Trade Association (Iceland, Liechtenstein, Norway, and Switzerland) should also have customs paid by us as part of our agreement with the third party shippers. Full transparency... we're printing Savage Worlds Adventure Edition no matter what and have the funds to do so. The Kickstarter is to help spread awareness (we're a very small company so marketing is always difficult--please help spread the word!) and to create all the extras like the acrylic templates, adventures, and other surprises we hope to to reach via our Stretch Goals. FOR RETAILERS ONLY - Sign up now for $1 and we'll contact you when we're ready to ship so you can preorder the items you want! 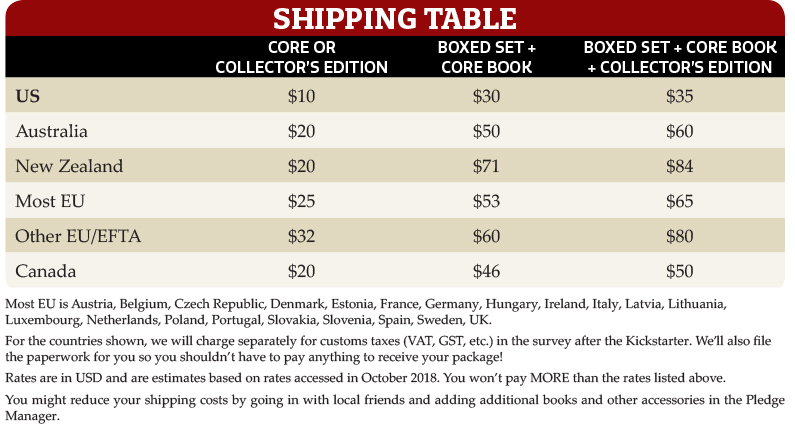 You'll get your shipment *before* it hits general distribution AND you'll have the option to add other stock for Savage Worlds, all at a great discount! This reward is for verified brick and mortar retail stores only. This is the reward level for digital backers, which includes the Core Book, World Builder's Guide, and all digital Stretch Goals! You'll be able to upgrade to a physical reward level in the survey after the Kickstarter, with applicable shipping fees. Add On items require a physical reward level to order. This reward includes a hardcover Core Book and PDF copy, and all digital Stretch Goals. You'll be able to upgrade to a higher reward level in the pledge manager after the Kickstarter, with the option to Add On additional items. The Collector's Edition is bound in black leatherette with golden metal grommets, matching corner protectors, stitched embroidery, and three satin bookmark ribbons. And it's signed by Savage Worlds creator Shane Lacy Hensley! This is a Kickstarter Exclusive and will not be available for retail sale. You will be able to upgrade to a higher reward level in the survey after the Kickstarter, with the option to Add On additional items. This reward includes a Core Book AND the Savage Worlds Essentials Boxed Set, with all the accessories you need to start playing immediately! See all the components below, and check the Stretch Goals for any more that might wind up in your box! This level includes a regular edition of the Core Book, the signed Collector's Edition, AND the Savage Worlds Essentials Boxed Set (see below for all it includes!). You may Add On additional items in the pledge manager to this reward level. The Collector's Edition is a Kickstarter Exclusive and will not be available for retail sale.